Out of all the video poker games, this is probably the best one to play for free. That's because, as much fun as it is (and it is fun), the house edge is quite high, so if you are playing for cash, then you would be better off playing a different version of the great game (like deuces wild, for example). The game is based on 5 Card Stud poker, with 3 cards for the player and 2 shared cards (the community cards). It is quite a slow, gentle game, so can be popular if with people that just want to relax and enjoy the game, rather than the adrenalin. Let it Ride is a double Bonus, 3-card hand variant, where the player submits three equal amount bets in the separate betting areas. Once the wagers are confirmed, the machine will deal three cards for the player and two community cards face down. The players will then have two choices – they can either “Let it Ride” or “Pull”. Selecting the first option will reveal one of the two community cards. Once again, the players will get to decide which way to go - proceed with the hand they have or remove one of the bets. If one decides to Pull both times, only one of the three bets will be wagered, excluding the optional side bets. The round ends when the community cards are opened and the players will win if the hand has a pair of 10s or a higher ranked combination. 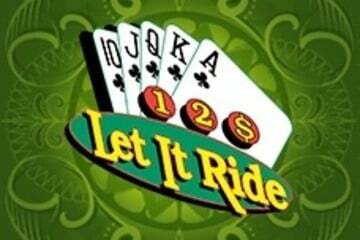 There are two extra bets in Let it Ride Video Poker, the Bonus bet which is usually fixed and 3 Card Bonus which the players can adjust. Side bets have their own paytable and the payout rates are worth the risk – some machines will generate 20,000 to 1 payout for Royal Flush hand or 5 to 1 for Three of a Kind. 3 Card bonus on the other hand has more moderate payouts, starting with even money for a Pair and up to 50 to 1 for a Mini Royal hand. What is the best strategy for this variant? After one community card is revealed, the player should ride when the 4-card hand contains a pair of 10s or up, Three of a Kind, Four of a Kind, four suited cards, four cards to outside Straight and four cards to Inside Straight. One of the best places to play Let it Ride Video Poker is the famous New York -New York casino in Las Vegas, although one should not have any problems finding this variant in other casinos in Atlantic City or across exotic European resorts.